This model is the spiritual predecessor of the later Duomatic two-speed hub, although the mechanics of the Zweigang aka Doppel-Torpedo is different and has more in common with the Dreigang models. As the freewheel mechanism uses roller locking, it is silent in both gears (no spring actuated pawls clicking) while you pedal or coast/freewheel. The two gears are direct drive and under drive, meaning with a correctly chosen external gearing ratio like 48/17 with a 28" wheel, your primary cruising gear will be direct drive, which has no power loss on this hub (sun gear locked to the planet carrier with no idle planet gear to ring gear rotation). 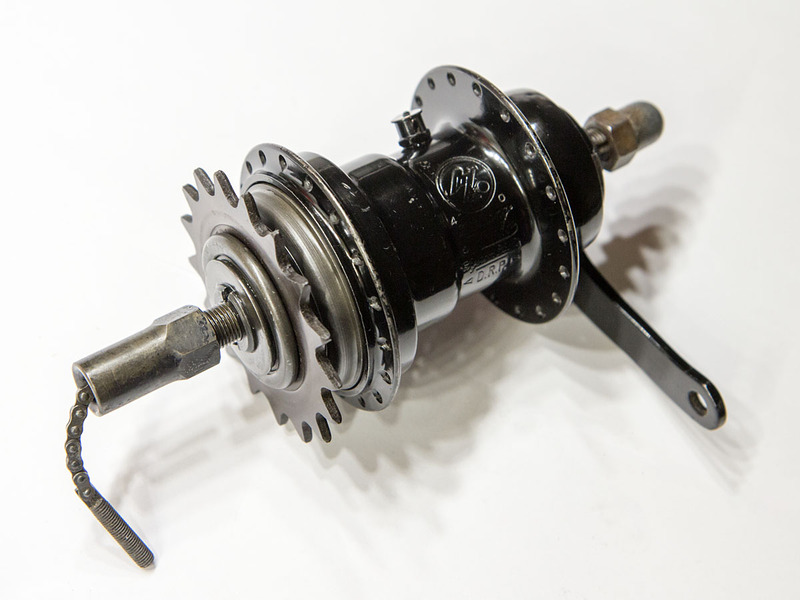 Newer two-speed hubs like the F&S Duomatic and Sturmey Archer S2C Kick-shift instead have direct drive and over drive, meaning that you do get a little bit of power loss in the over drive gear, which is the primary cruising gear on those models. Disassembly is done from the left (brake) side. Note that the left side of the axle has a diameter of 9.5 mm (3/8") x 26 TPI but the right side is 10.5 mm x 26 TPI as on many later F&S gear hubs. 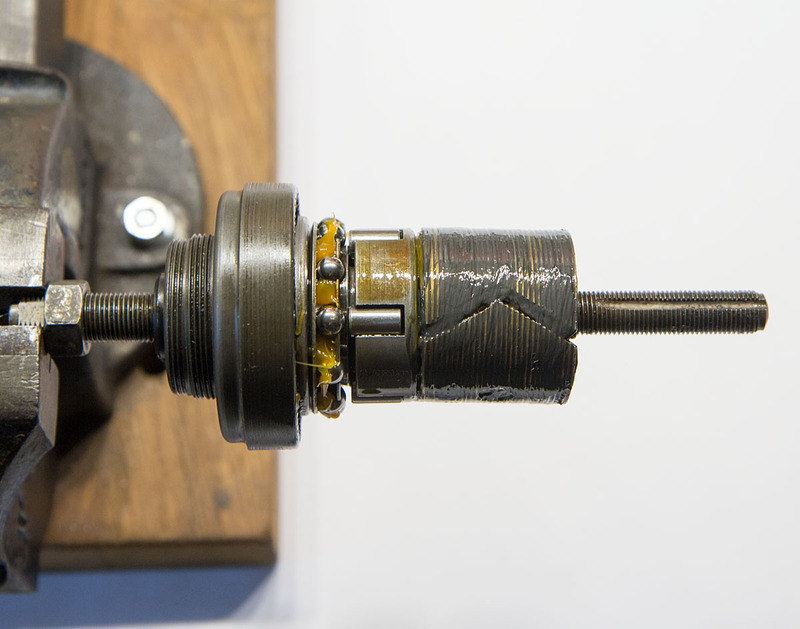 The brake cone and arm assembly is threaded on the axle, so you can use the brake arm to hold on to as leverage when the lock nut is loosened. 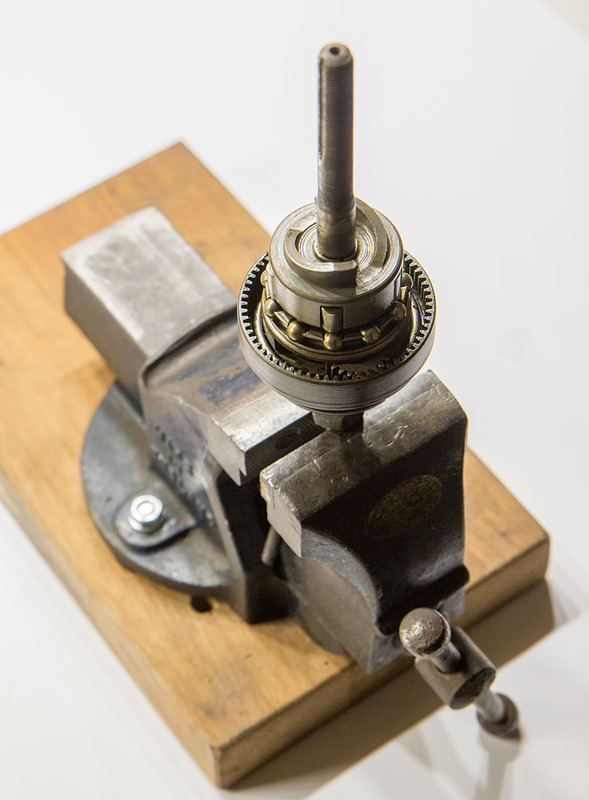 The right (drive) side of the axle has flats to mount it in a vise, but do not rely on these if the lock nut on the left side is very tight, as it could damage the axle. Originally, the Zweigang was only lubricated with oil, which makes this example very clean looking apart from some brown spots of dried-up oil. However, it will be re-assembled using a combination of different greases and oil as recommended by Scheunenfun. More on this later on this page. 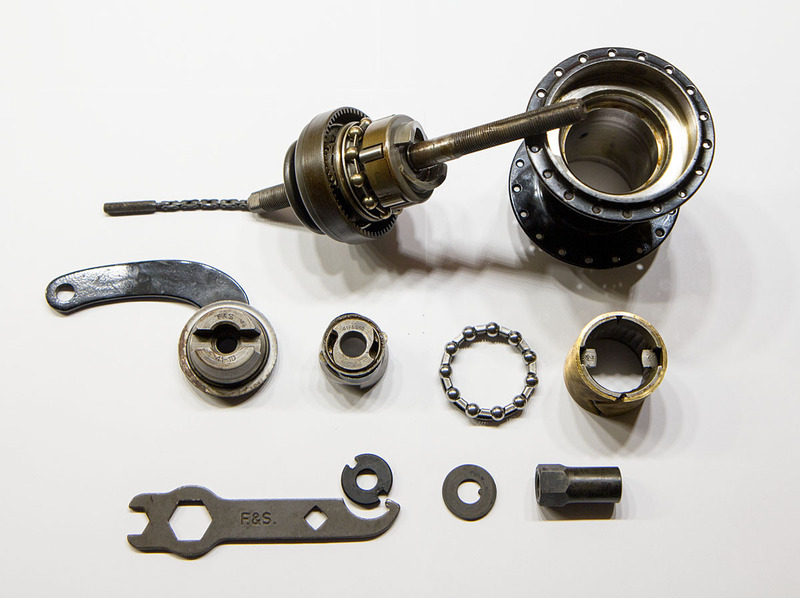 Exploded view photo of the hub internals after cleaning. Click for full size. The reassembly starts with greasing the sun gear and axle ball bearing. The grease I use is Exustar E-G02+ but any similar grease designed for ball bearings should work. 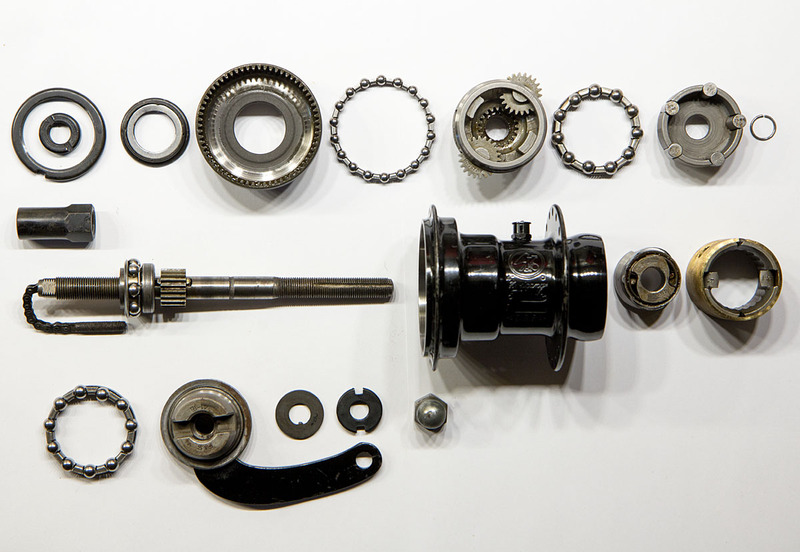 Ring gear, planet gears and bearings similarly greased. The planet carrier retention ring/inner ball bearing race is press-fit on and I didn't want to remove it, so the shafts of the planet gears was lubricated with motor oil. 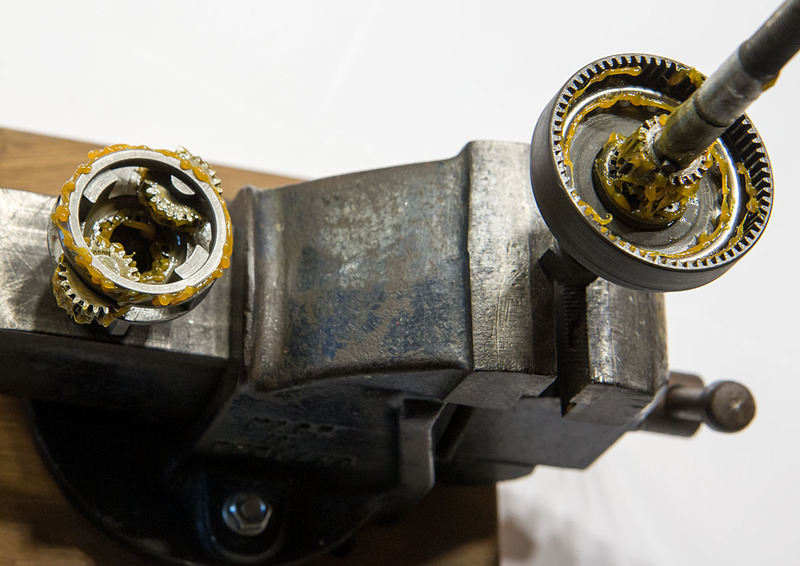 The roller lock mechanism must not be lubricated with grease. Use oil instead. 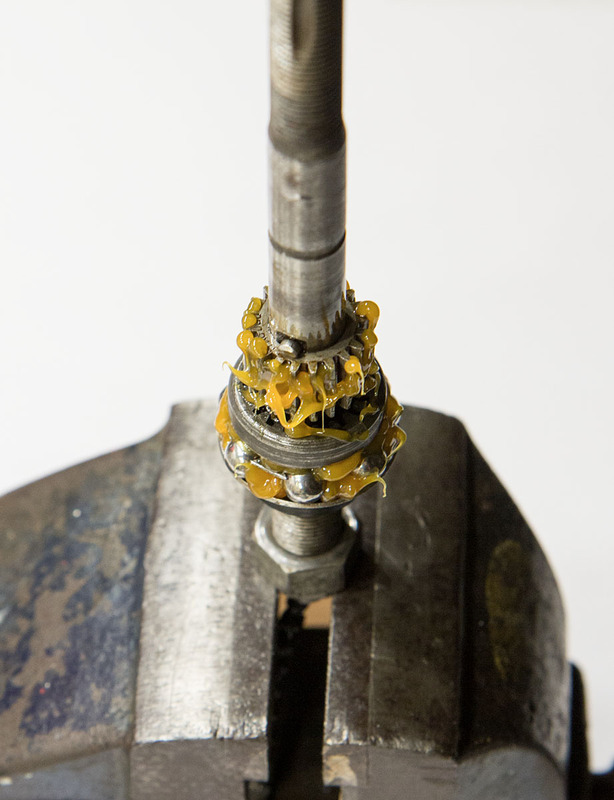 With grease, the rollers will stick a bit and not move freely, possibly making the drive engagement sluggish. 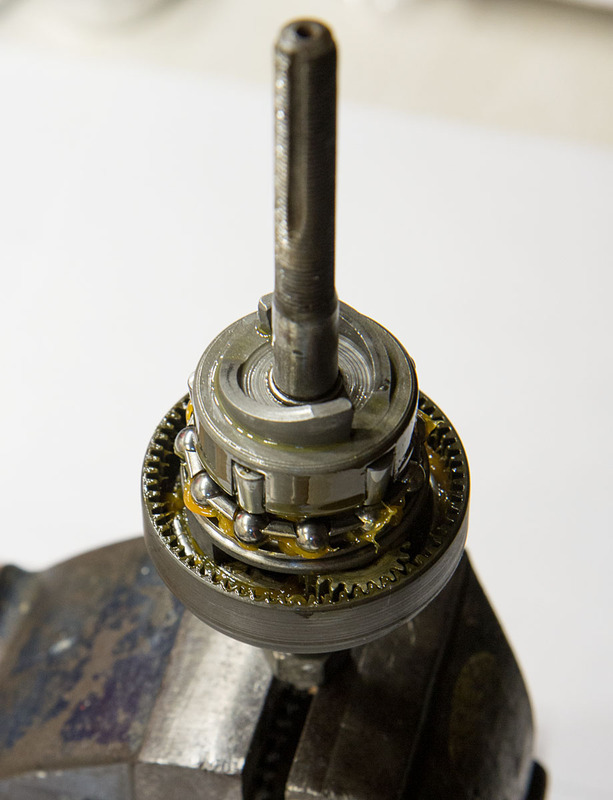 This also applies to hubs with drive pawls, which should also only be lubricated with oil. The brake spreader cones must be greased and the brake cylinder must be greased with high temperature resistant brake grease. The officially recommended brake cylinder grease from Fichtel & Sachs or SRAM is getting increasingly difficult to find after SRAM stopped production of internally geared hubs and spare parts in 2017, so I use Shimano Roller Brake Grease (part number Y04140020 or Y04120400) which is designed for high temperature metal-to-metal friction contact. It's the grey stuff on the above photo.